Has it ever happened to you? It’s day 1 of your diet. Again. You have the best intentions, you’re finally going to lose that weight and be thin and happy and now your life will be perfect. Your first day goes great. You’ve stuck to your plan 100%. Maybe another day or two goes by and then, all of a sudden, you do something “wrong”. You eat a cookie, a potato chip, it doesn’t matter what it is, it’s something that defies the rigid rules you’ve set up for yourself. And then, before you know it, there you are in the middle of a binge. You’re not necessarily enjoying it, but it all happens so fast that it seems as though you were possessed by some kind of binge monster! You’re eating furiously, anything you can get your hands on. Foods that you don’t even necessarily care about normally, but you can’t stop. You’re eating and eating and eating and you can’t even taste the food. It feels like it’s going down at 100 miles per hour, and you still can’t seem to stop yourself. And then. There you are. Full. Disgusted. Ashamed. Angry at yourself. Depressed. So what do you do? Do you call yourself self-deprecating names? Do you turn to food to help you numb out the feelings of being disappointed in yourself or even worse, hating yourself? Do you punish yourself by restricting? Do you purge the calories by over exercising, taking laxatives or vomiting? It doesn’t have to be this way! You can be free from the cycle of obsessive dieting and compulsive eating. The following steps will help get you on the road to recovery. Kinda scary, huh? Many people think that if they cease to diet, that they will lose control completely. But for many, it’s liberating. Dieting sets up a precedent that’s very difficult to stick to. Diets often recommend that we eat only a certain amount of calories per day, some suggest that we cut out whole food groups such as carbohydrates. If these rules are somehow broken, it’s possible to feel like a failure, many people feel as though they messed up the whole day and thus to go to the other extreme and binge with the idea that they can compensate by going back on their diet the next day. Deleting the word diet does not mean that you are giving up your aspirations of healthfulness. This is about self-acceptance and recovery. You can accept yourself as you are in the moment AND do things to help yourself to become healthy. Keeping a food and feelings journal is tremendously helpful. This enables you to understand when and why you binge. Perhaps you got some bad news on the phone, or you had some kind of mini-traumatic event at work, maybe you ran into a person who triggered some bad feelings that you have about yourself. It’s difficult to know. Many people aren’t even aware of why they are feeling bad. Keeping a journal can help you to know what triggers your binges. Write down everything that you eat for 2-3 weeks. In the margins, write how you were feeling. If you binge, write that down as well. Write down things that happened that day, write down what happened before the binge. Write down how you felt after the binge. You are becoming an investigative journalist uncovering truths about yourself. This kind of self-knowledge will help you understand and recognize your triggers and thus enable you to find options to stop a binge before they begin. Many people will compulsively eat or diet soothe themselves, but how are you wounding yourself? Is it with unkind words? Is it with food? Is it with restrictive dieting? If you find yourself going for the food, first ask yourself, “am I hungry?” if not, what else might be going on? “Am I angry? Am I tired? Am I lonely? Am I bored?” Set a timer and see if you can go ten minutes without the binge. During these ten minutes, write about your feelings. Make a phone call to a loving, supportive, safe person, or just sit alone and allow yourself feel the uncomfortable feeling. As you learn to sit with uncomfortable feelings, set the timer for longer. As the weeks go on, you’ll be surprised at how long you might be able to postpone a binge. At first it might be moments, but eventually it will grow to hours, then days, then weeks. Children know when they are hungry and when they are full. However, the nurturing mother, in her attempts to nourish her child will usually distrust the child’s internal cues and force the child to take “just one more bite,” or to “clean your plate.” Clearly, these suggestions were made with the best of intentions, however, many people grow up not trusting their own instincts about hunger and wind up eating whatever is on their plate regardless of whether they are hungry or not. In the beginning of your recovery, it might be important to eat by the clock to ensure that you are eating your three meals per day, however, it is important to figure out when you are hungry and when you aren’t. This hunger/satiety scale can help you to relearn your cues of hunger. During at least one meal per day, rate yourself before your meal, half way through your meal and at the end of your meal to figure out where on the scale you are. Put your fork down, sit quietly, close your eyes and tune into your body to see where you are, then rate yourself using the following scale. 5 = You are feeling neutral, neither hungry or full. 10= You are stuffed, feeling sick, having to unbutton your pants. Try to not to allow yourself to go below a 3 and try to stop eating before you get to a 7. It’s important not to let yourself get too hungry. Allow yourself to snack on high protein foods such as string cheese or yogurt during the day so that you are not ravenous when meal times come. This will help to prevent bingeing. Many people recover with the help of therapist, group therapy or a 12-step program such as Overeaters Anonymous or Eating Disorders Anonymous. Many people use both. Having people who are going through similar recovery can be very comforting. The support is invaluable and having someone to turn to who is going through the same thing as you are is a great way to talk through your feelings and figure out what is going on instead of turning to the food for support. Be patient and loving with yourself. Progress is not linear. Many compulsive eaters are looking for a quick fix. For every accomplishment it is possible to experience a set back. But these set backs can be great information and learning experiences to find a way to do things differently. Each binge can give you information about yourself. Recovery time is slower and more methodical. It takes time to unlearn all the negative feelings that we have established about ourselves and do undo all the false beliefs that we have about ourselves. Repeating daily affirmations are amazing for combating such beliefs. Some people say things such as “I love myself no matter what,” or “I am loved, loving, capable and strong,” each night several times as they’re falling asleep. It can feel difficult or uncomfortable or untrue at first. Do it anyway. It’s necessary to have ammunition against the voices that are giving you negative messages about yourself. Don’t let them win. Online Binge Eating Treatment - LEARN MORE! Most recent quote from community member: "Unbelievable progress. I had a slice of cake, wasn't that fussed about it and moved on. Cake is just cake! I never thought I'd get to this place. I keep thinking back to an earlier meditation when all the negative energy left down through my feet. That was really powerful. I'm planning to play it again. I've also drawn up a weekly meal plan of healthy balanced meals. This just helps to give me a bit of guidance and planning and eliminates any need for impulsive decisions when I often feel stressed after work. Amazing, thank you so much. I always hoped for hope, but n ow I feel like I'm living hope! I'm so grateful Leora. Thank you." 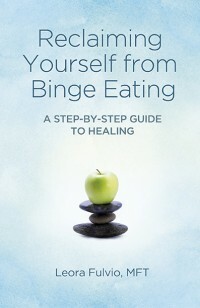 Posted in: binge eating, eating disorder. Tagged: binge eating help, binge eating therapy, how to stop binge eating, how to stop binge eating now. I am going to do this. Write down my feelings and food in a journal to see why I am eating so much. hi. what a great and helpful website you have created. i have binged and gone up and down weight wise my entire adult life. now at 46 i am still battling with binge eating. i read somewhere there is a reason we continue to binge, that it is benefitting us in some way. i understand the principle but am at a loss as to how it is benefitting me as i feel awful after bingeing and gaining. currently i am bingeing mindlessly every day as if there is no reason at all other than feeling completely hopeless, helpless, mindless and destined to be this body type. it feels impossible to be slim trim and brim full of energy as i was 3 years ago.. why is it so hard? ?